On Thursday I posted that I had just heard William Barber of the Poor People's Campaign (@UniteThePoor) and Moral Mondays issue a call for a moral revival of America. I was so moved I joined the Poor People's Campaign and am supporting it financially, as well. William Barber talked about how the power structure of much of American politics is "mean" -- and hurting the poorest among us. He back his premise up with with facts and figures -- including the economic cost to our country of NOT helping "the least of these." As he said, this is not a Republican issue or Democrat issue-- though my friends who are Republicans will probably not like some of strong words he has about the present administration and congressional leaders. And some of what he said could have been applied, in my opinion, about the Obama, Bush, and Clinton administrations. This is a moral issue for people of faith to consider. I especially liked that he said that this must be a united movement -- not just about lifting the poor, but also working for women's rights, defeating racism, saving the environment, ensuring LBGQT rights and safety, working for peace, et al as these are all interrelated and each impacts the others. A house divided against itself cannot stand, as Lincoln said, and too much of America is divided. Those of us who are are concerned about the above must unite. We must work together -- and not overly criticize the methods and approaches we choose to undertake this task. I have friends who are very activist and "in-your-face" as they speak truth to power. I applaud and support them. That, though is not my call. I will work with the Poor People's Campaign and other efforts in gentler way. I want to speak truth to power -- but I want to do it love -- in a way that doesn't hurt my soul while still hopefully speaking to that of God in those of power. Again, I agree with William Barber that this is not a Republican issue, a Democrat issue, a women's issue, an environmentalist issue, a men's issue, etc. It is an American issue -- calling us to remember the best vision of those who came before us for our country. I know we are a pluralistic society -- not exclusively Christian (not that we ever were!) -- but I do think the best vision of what the United States could be is In Matthew 5:14, when Jesus tells his listeners, "You are the light of the world. A city that is set on a hill cannot be hidden." May we all work to be that light -- by following the Light and looking for that of God in others and ourselves. May God bless our efforts. 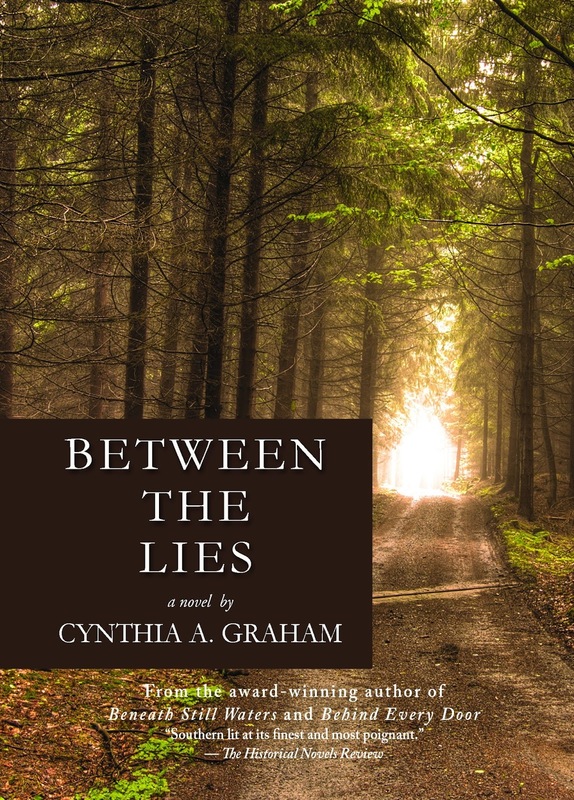 Between the Lies is Cynthia Graham's newest book, a contemporary Southern Gothic mystery set in the 1950s. It tells the story of how Sheriff Hick Blackburn of Cherokee Crossing, Arkansas finds himself enmeshed in a case of a young Black man being railroaded for a crime that Blackburn's pretty sure the boy didn't commit -- but is in a town outside his jurisdiction. This is set in a few hot, humid July days in 1954. And more than the weather is hot and sticky. Graham's story deals with small town corruption and racism, the power and abuse of white privilege, political expediency, Jim Crow, family loyalty, and more. She weaves all these together into a compelling tale well told. The landmark 1954 Brown v. Board of Education of Topeka, ruling by the U.S. Supreme Court declaring state laws that established "separate but equal" public schools for black and white students were unconstitutional figures prominently in Between the Lies. So does the burgeoning role of the U.S. Department of Justice in the field of civil rights (though the Department of Justice did not have a full division addressing civil rights until 1957). Primarily, though, this is the story of one man and two towns coming to grips with insidious racism and corruption engendered by it. Broken Creek, Arkansas is not Mayberry, North Carolina. And Sheriff Earl Brewster is no Sheriff Andy Taylor. Broken Creek and Brewster are both dark -- even in the light of day. Perhaps even more so in the light of day. 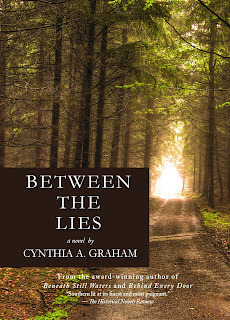 Graham's story-line is tight and her characters are well-written and believable. Hick is a good guy who's flawed, Brewster is a baddie who you love to hate but who has some (hard to find) redeeming motivations, there's a Pulitzer seeking small town newspaper man, befuddled mostly good-hearted deputies, an earnest young female lawyer, parents trying to do their best for their children, moonshiners, compromised clergy, and more. Each character is integral to the story. There's not a wasted bit of dialogue and the story moves at a good pace. I won't say more about the story-line. To do so would, I fear, ruin it for readers. Let me just say that this was a book that kept me reading. Though set in 1954, it has a lot to say to us today (without being preachy -- which it could have easily become). It held my interest all the way through. There were a number of things that I didn't see coming (always good in a mystery). And the ending was a mixture of relief, wondering, and sadness. I am looking forward to reading more about Hick Blackburn. I like this man who struggles with his past and grows into his future. I went to a film premiere last evening. That's not something I often do. Peggy Tierney, a good friend and fellow Quaker, gave Nancy and me tickets to the premiere of "Eva," the story of a remarkable woman. 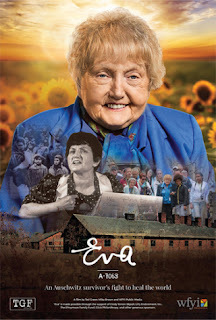 Nancy and I knew some of Eva Mozes Kor's story. We had visited her CANDLES Holocaust Museum in Terre Haute, Indiana where she met with us. And I'd read (and blurbed) her book Surviving the Angel of Death: The True Story of A Mengele Twin in Auschwitz published by my friend Peggy's Tanglewood Publishing. It's a powerful book for readers from 6th grade on through adult. Despite this I was not prepared for the effect being at the premiere had on me. At one level it was a very nice evening. I enjoyed seeing friends and learning more about the production of the film. And as the film progressed it was grand to see Peggy and her son Gabriel featured in the film, along with my rabbi friends Sandy and Dennis Sasso. Peggy had told me that Gabriel's going with Eva to Auschwitz changed his life. It was good to hear him tell that story himself. Gabriel was a natural on screen -- so composed, well-spoken, and passionate. My favorite line of his was, "Eva's a 4'9" badass!" The Sassos both talked about how forgiveness is at the heart of Judaism (other theologians/rabbis in the film disagreed), citing the opening prayer of Yom Kippur. Sandy, though, noted that not everyone can pray it or forgive others of the sins committed against themselves. I especially appreciated her comments (as I recall them) about how criticizing others who can't forgive is not helpful or good. I certainly can understand why some of the victims feel unable to forgive. While I hope that I could, flawed as I am, I'm not certain I could. The film, though certainly presenting Eva as a heroic figure, pulled no punches. She is portrayed not as a saint but as a real life woman who suffered horribly (her parents and two of her sisters were killed in the camp and her twin died as a result of Nazi "experiments" performed on her) and who eventually learned the power of forgiveness. The film shows Eva's life as an angry activist, pushing countries and media to search for Dr. Mengele, disrupting the "nice" Holocaust memorials (she was arrested at one in the US Capitol rotunda), and more. It tells how she came to forgive and why. The film also interviews other survivors who vehemently disapprove of her forgiveness stance. It showed Eva's work since to promote forgiveness, healing, and peace as the way this world needs to go. The film shows her moving from anger to love, all the while never forgetting what she and the others interred in those camps endured. She bears witness both to the evils and horrors of Nazi brutality and to the power of forgiveness. This film shows how Eva models the truth of Quaker William Penn's statement, "Force may subdue, but love gains, and he that forgives first wins the laurel", the laurel, in Eva's case, being a release of the anger and bitterness that was consuming her. It is a story of triumph of the human spirit when it's empowered by reconciliation and forgiveness -- even in the face of the unforgivable. Eva is a powerhouse -- and a scamp. She has a delightful sense of humor, speaks her mind (often without a filter), and feels she has lots of work still do (at 84). She gave remarks after the film and our Governor, Eric Holcomb, who also appears in the film presented her with a bouquet and a big hug (he's 6'6" -- so quite a contrast between the two). This powerful film deserves a wide viewership. It will be in film festivals around the US and world and hopefully distributed to movie theaters and PBS stations (the producers and sponsor are working on distribution deals). It will be on WFYI-TV in Indianapolis on October 25. At 10, she survived experiments by Nazi doctor Josef Mengele. At 50, she helped launch the biggest manhunt in history. Peace. Humanity. Forgiveness. Three things this world so desperately needs. Thank you, Eva. I did something foolish -- or at least unusual -- for Quakers yesterday. I preached from the lectionary at our local meeting. The reading was John 12:20-33. What follows comes from my study of that text -- thought it might not seem like it. Easter falls on April 1 – April Fool’s Day. April 1st is a day for joking around. Which is one reason Nancy and I got married the day after April 1st. This joking around is an old practice. You see April Fool’s started almost five hundred years ago. In no way is that more true then it is as we look toward Easter. Easter centers around foolishness. No, not human foolishness – though it may give us some comfort to think that way about Pilate, Herod, Judas, the “crucify him” crowd or even the thick headed disciples. But the foolishness I’m thinking of is foolishness to the extreme – the folly of Jesus. It may make us uncomfortable to think of him that way, but Jesus was the ultimate fool. At least by the world’s standards. a sampling of fabulous beasts and birds. salt, the apple and lamb. screams of your parents and children. The answer is intelligently clear – no, we do not accept. What kind of fools do you take us for? Fools like Christ? Foolish, foolish Jesus. His actions confound us to this day, if we really stop and think about them. Why must you always play the clown? How can the say "love is cruel"? They catch the ring but drop the jewel. And unto the losers comes their Prize. Who, indeed, is the true April Fool – the Christ who comes turning mourning into dancing, dying for his enemies, baking fish by the seaside for his friends, or us, so wise by the world’s standards, who guard what we have, repay slights with interest, and pray loud, but not so well? Let us, when we arrive at this April Fool’s Day, remember the greatest Fool of all – the everliving Christ who comes dancing from the grave, who defeats death that we might live, who forgives all prodigals, who gives himself for others. May we become, as Paul urges us, “Fool’s for Christ’s sake,” giving our lives for each other and Him.